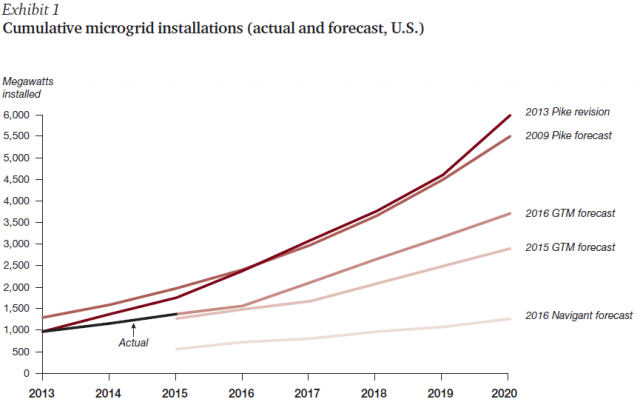 Mid-tier microgrid investment (microgrids to power neighborhoods, commercial/industrial facilities and government/public services institutions, such as schools, university campuses, hospitals and military bases) is falling short of initial growth forecasts, posing challenges to industrial suppliers and manufacturers, according to a strategy report released earlier this month. Leading microgid project contractors and manufacturers are finding it difficult to progress beyond demo and pilot-stage projects, according to multinational management consultancy PwC’s global team of Strategy& specialists . Maintaining the view that the power industry market segment holds the potential for robust growth, leading market participants, more specifically power utilities and industrial engineering companies, are keen to stay in the game, however. Still in the early stages of development, they see the possibility of building significant early market share, but that comes with attendant technological, operational and business risks, according to Strategy&. Market players can better manage them and increase the likelihood of market success by focusing on three key strategic factors: Standardization; the ability to offer a microgrid as a total solution; and alignment among the manufacturer, customer, the utility, regulators and other authorities. Improving the reliability of electricity service is the primary reason most customers have decided to deploy local microgrids. Enhancing the sustainability of electrical power supply is a secondary factor, and the potential to incorporate emissions-free renewable energy resources is seen as valuable, as well, the report authors highlight. ¨Compared with central station generation, this ‘neighborhood grid’ offers greater reliability, the potential for lower emissions, and adaptability to local needs. The idea is that with these advantages, microgrids could become a basic business model for power and utility companies for both commercial and community/residential areas. Consumer education is warranted in order to convince customers and other stakeholders that microgrids can yield cost savings by improving energy security, grid reliability, resiliency and efficiency, as well as environmental and human health and safety. Providing emergency back-up power is another key aspect. ¨If suppliers can coordinate effectively and bring down system costs, then microgrids can compete with traditional backup power. If not, customers (reasonably) will opt for stand-alone backup generators,¨ they assert. Furthermore, challenges increase along with increasing microgrid investment opportunities, the report authors point out. As the number of deployments increases it becomes more challenging to integrate individual local microgrid systems with one another and traditional centralized grids, they say. Continuing, they view self-contained institutions that require a high, constant supply of electrical power – hospitals, schools, military bases and small manufacturing plants – as holding out the best customer prospects. Greater participation on the part of power utilities is needed if the market is to develop fully, however. To date, independent third parties have deployed, own and operate around 70% of microgrid deployments in utility services territories, the report authors point out. Ultimately, microgrid market participants should aim to realize an approach that incorporates all three key elements within a strategic plan in sync with the needs and aims of supply chain partners, customers, regulators and within the context of contributing to solving broader public and society challenges, according to the report. ¨With the right modular design and turnkey technologies, embedded with software and ‘Internet of Things’–style sensors, this approach can overcome many of the barriers for the end market.¨ the strategy specialists write. Adopting this type of approach also opens up the possibility of extending value chains and suggesting alternative business models, such as “microgrids as a service” and similar bundles of microgrid operations and maintenance services that can improve market efficiency. Finally, this type of approach can result in cost savings and increase gains by enabling companies to clearly identify their strategic position and determine the specific business model(s) to employ with channel partners, original equipment manufacturers, and other stakeholders, Washington, D.C.-based PwC Strategy& group authors conclude.